e-Commerce enabled website is a cost-effective way to promote your business online. e-Commerce includes a website or a web based system, an impressive shopping cart, payment gateway integration, Secure and scalable hosting and marketing knowledge. Clipper Byte Solutions gained substantial experience in every aspects of e-Commerce. e-Commerce includes a website or a web based system, an impressive shopping cart, payment gateway integration, Secure and scalable hosting and marketing knowledge. Clipper Byte Solutions gained substantial experience in every aspects of e-Commerce. Majority of our projects are custom shopping carts and not from a product or an open-source. This approach gives our client an edge over their competitors by including unique selling aspects. Our range of e-commerce services include online store creations, advanced custom shopping carts development and integration. e-Commerce includes a Website or a Web based System, an impressive Shopping Cart and Payment Gateway Integration. 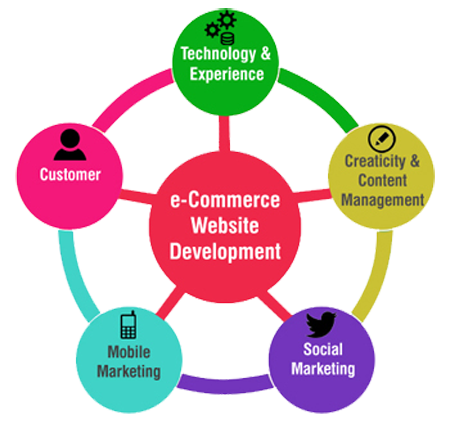 We have experienced development team specifically for e-Commerce enabled Website. Best Ecommerce Solution for Your Online Business at Clipper Byte. When searching for effective options in eCommerce website development, more specifically, solutions that offer shopping cart development, seek options that afford the immediate ability to start using the product, which is commonly referred to as turnkey. Once you have established a new hosting account and have completed populating your online store, you should be able to instantly launch the site and start accepting orders. Educate yourself prior to launching your site on what methods of payment will be accepted and how you want to receive them. Payment gateway integration is vital when setting up your online establishment. It's key to seek a Ecommerce Website Development company that provides eCommerce applications that afford you viable choices involving how and when you are paid. Clipperbyte solution is a professional ecommerce website development company in Delhi engaged in website designing, shopping cart and Payment Gateway Integration. Many businesses worry about how expensive shopping cart development will be and though in the recent past, this was the case, it is no longer a burden in eCommerce website development due to the fact that contemporary technology has afforded developers to provide with attractive and easily embeddable shopping cart integration with a variety of templates that include a shopping cart and can be chosen to a clients specifications. Since these products have been mass produced, this cuts down on costs and fulfills the demand quickly and easily and allows you as a business owner to save time and money. It will benefit you to seek the most customizable package that will facilitate future expansion. Keep this in mind when shopping for an eCommerce solution. Provided your business catches on and begins to grow, you will likely need to expand your offerings in the future. It's a smart idea to seek a ecommerce website development package that facilitates future expansion when you initially set up your establishment rather than needing to switch companies to suit your needs later. It's in your best interest to be assured that your development company provides options that will get your business noticed. If nobody visits your website and consequently purchases your products, there really is no point in installing these eCommerce solutions in the first place. Items such as social media sharing, for one, should be present to allow you to quickly and easily reach your target audience and get your business seen! Be sure to research how search engine optimization is integrated into your site as this is a vital element in being found, also. Portals are providing on-demand information to users, customers & partners. With streamlined communication, a well-structured portal can become intrinsic part of your business strategy. Web Portals primarily focus on online community building and get users to register and use the services on regular basis. We provides customized portal development as per your requirement which have various interactive tools such as message board, discussion forums, rating tools, voting polls, blog community, real time chat, videos and Image gallery etc. Our expertise with web portal development and portal maintenance extends to cover all possible needs. We have designed and developed multi dimensional web portals, be it B2B (Business to Business) portals, B2C (Business to Consumer) portals, or e-commerce portals, SharePoint Portal Development. Our Portal Development services include Offshore Portal Designing, Development and Maintenance.